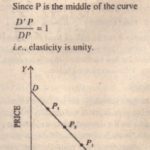 Apart from the practical importance of the concept of elasticity of demand, the concept plays a crucial role in economic theory and is extensively used as a tool of economic analysis. We mention below some aspects of economic theory where use is made of this concept. Price Determination. 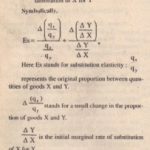 As will be clear from the discussion on product pricing (Part IV), the concept of elasticity of demand is used in explaining the determination of price under various market conditions. For instance, under perfect competition. the demand curve facing an individual seller is perfectly elastic which means that the producer can sell any amount by lowering the price a bit. But under monopoly or imperfect competition. the demand is less than perfectly elastic and the demand curve is downward sloping. Since the demand is less elastic. the monopolist is in a position to exercise some control over price and the buyer has to accept the price. 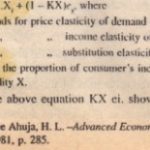 Relation Between Price Elasticity. Average Revenue and Marginal Revenue, There is a close relationship between price elasticity, average revenue and marginal revenue which the concept of elasticity helps to explain. This relationship enables us to understand and compare the conditions of equilibrium under different market conditions. The formula which tor of production is less elastic, its share in the national dividend is higher, and vice verse. If elasticity of substitution is high, the share will be low. Conclusion. Thus, the concept of elasticity of demand is highly useful as a tool of economic analysis. We have been studying demand so far from the point of the consumer. It is worthwhile to shift the angle and try to look at it from the point of view of the setter. The demand price, i.e., the price which a consumer is willing to pay, is the income or revenue of the setter. It is called the average revenue (AR). The income that the seller gets by selling an additional unit of the commodity is called marginal revenue or MR. It may also be noted that the demand for a commodity, say wheat, may be inelastic from the point.